Penicillin is a group of antibiotics that cause an effective medication against the bacterial infections. This was first discovered by Alexander Fleming in the year 1928.There are different types of penicillin such as Penicillin G, Penicillin V, Procaine Penicillin. Among all this Penicillin V is widely used for the treatment of various infectious diseases caused by staphylococcal bacteria. Penicillin generally belongs to the beta-lactam family of antibiotics in which the member uses the similar mechanism to inhibit the bacterial cell growth where it kills the gram-negative bacteria whereas doesn’t cause any effect on gram-positive bacteria. Penicillium V potassium is an antibiotic that is used widely in the treatment of diseases caused by bacteria such as pneumonia, skin, ear, throat infection and scarlet fever. Penicillin drug sometimes becomes allergic to our immune system that causes common symptoms of hives, rash and itching at extreme cases the reaction may become severe like anaphylaxis, may affect multiple body systems and even a life-threatening condition. The less common allergic reaction occurs days and weeks after the exposure to the drug and may long until the drug is being taken. These common conditions include serum sickness, drug-induced anemia, Inflammation in the kidney. These are caused due to the hypersensitivity of the immune system for the drug, mistakenly recognizing it as a harmful substance. Exposure to the medication must be done at least once before the immune system can become sensitive If and when your immune system misidentifies penicillin as a harmful substance, it develops an antibody to the drug. 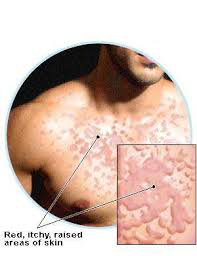 When the body is exposed to penicillin allergy there are few factors that can increase the risk such as food allergy, allergic to other drugs, family history to drug allergy, high dosage or repetitive of penicillin and certain disease that are associated with an allergic drug reaction. The best way of prevention to penicillin allergy is to avoid the drug, inform the healthcare worker and make sure it is recorded. A bracelet that identifies the drug allergy can wear that can ensure the proper treatment in case of emergency. If in case the allergy is severe, with the prescription a self-injecting syringe and needle epinephrine autoinjector can be carried.